The new antimicrobial shopping cart design allows the back wheels to rise slightly off the ground when nested. This eliminates flattening of the rear wheels as well as weld breaks when a group of carts are pushed by robotic cart pushers. Electric tub provides therapeutic steam and foot massage. 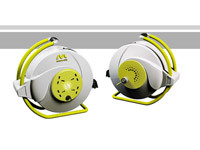 Electric cord reel rolls up electric wires quickly and neatly.